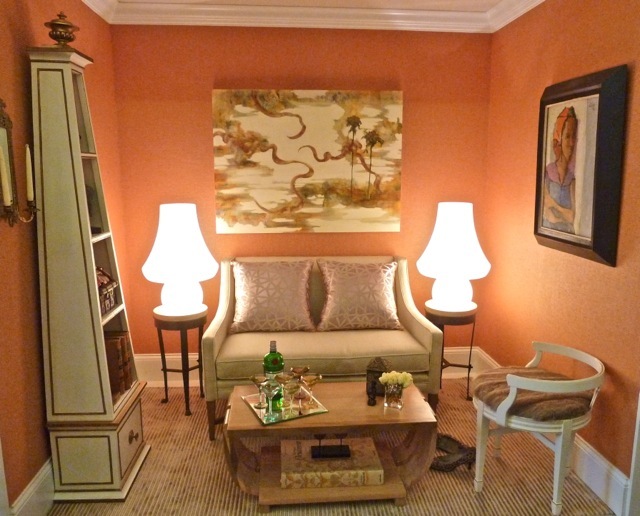 Connie Cooper‘s elegant vignette was intended as a media free space for the next generation. Bombarded by electronics all day long, Connie felt it was important for these young adults to have somewhere to relax and connect as people in real life without texting, emailing or talking on Facebook. Connie felt, as many of us do, that it was important to express the personality of the owner in the space. 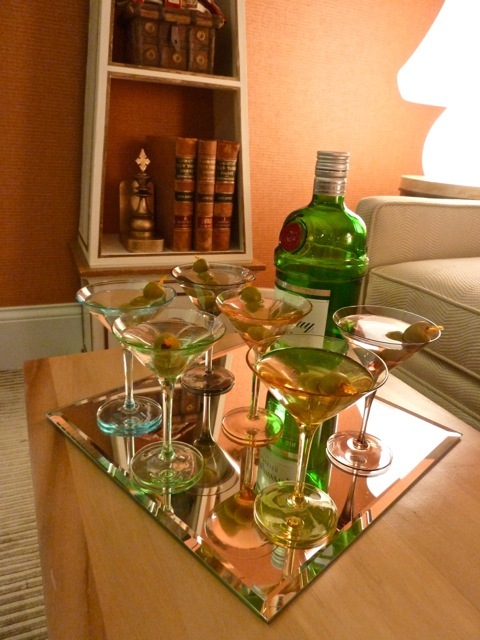 Obviously a girl who loves a good martini, Connie had a charming drinks tray ready for guests. The eclectic yet glamorous touches, such as the vintage Murano lamps and distinctive bookcase expressed Connie’s love of travel. 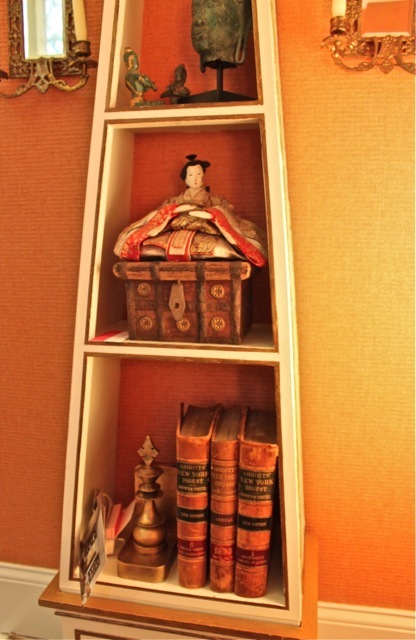 Filled with finds from trips to the Far East, the bookcase added a sophisticated personality to the space. And for a personal touch, Connie had an old fur coat of her mother’s repurposed as a charming seat cover. 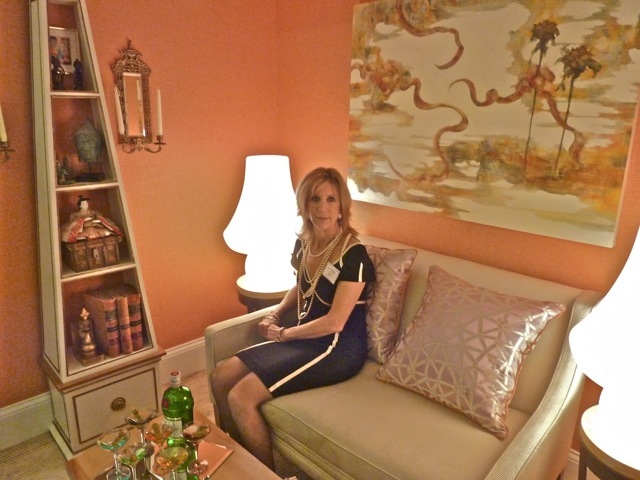 I love how the chic leopard pumps were a part of the vignette – a symbol of the cosmopolitan woman really relaxing in her home. Allison Hennessy‘s vignette was inspired by Albert Hadley’s sketches of Empire period tented rooms he executed while teaching at Parsons. With beautifully draped walls, a gilded sunburst mirror and a custom made “Parsons meet Empire” style desk, her space most definitely had Napoleonic flair. 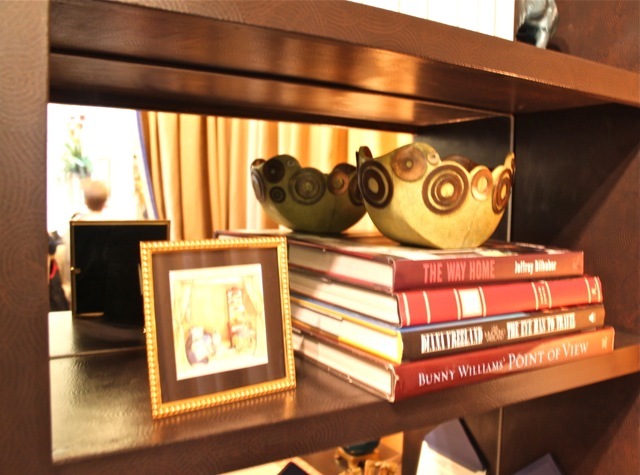 The mirror backing in the bookcase added both a reflective surface and chic glamour to the piece. 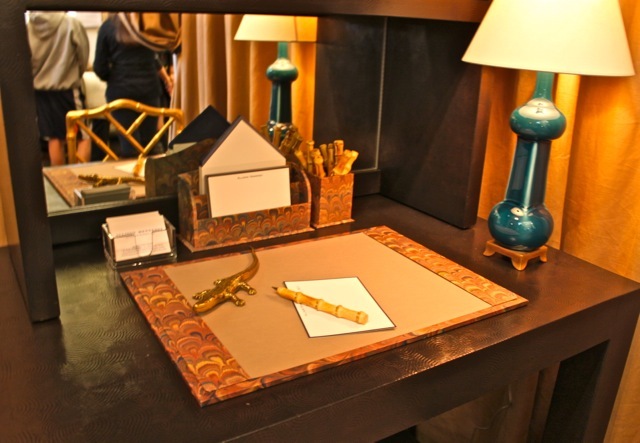 The well appointed desktop included beautiful Italian marbleized accessories and a whimsical English cast brass alligator paperweight. The “Hadley” lamp, named for its iconic designer was made by Christopher Spitzmiller in the most handsome shade of Prussian blue. I think Mr. Hadley would have approved! 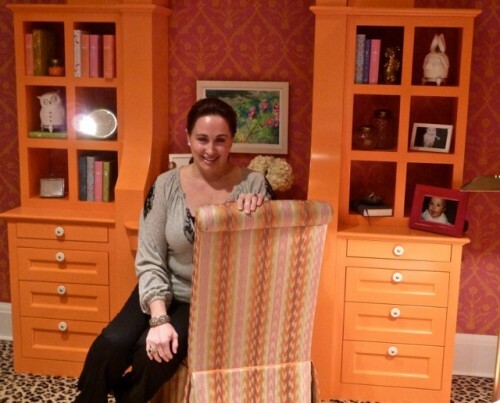 You can imagine my surprise when I first spied Melissa Marcogliese’s cheerful space. The orange desk was a show stopper! Built by Remy Ludwin at Prestige Remodeling, it is the centerpiece of the vignette Melissa designed for her 10 year old daughter Clementine. Can you see the fabulous pink and orange silhouette on the back wall? A great detail! And I know at Clementine’s age (ok – maybe still now) I would have loved to have all the little nooks for all my possessions. 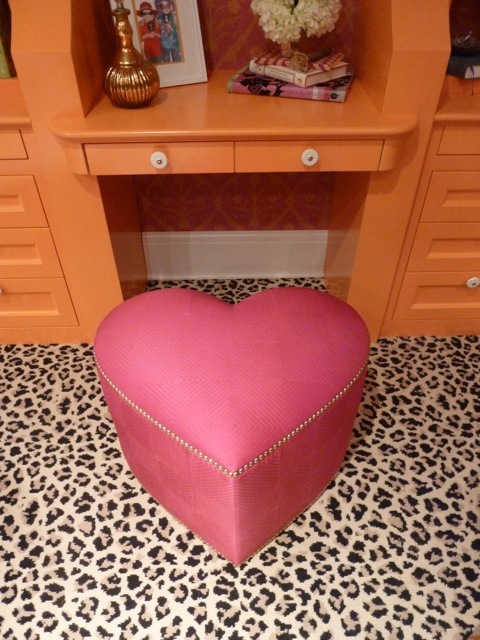 And how adorable is this fabulous heart shaped ottoman??!! With the fashionable nailhead trim and chic leopard print rug from Stark, I think it’s a sure bet Clementine would be the envy of all her double digit friends!! Don’t forget to stop by tomorrow for more reveal!! This entry posted in design, furniture, interior design. Entry Tags: Allison Hennessy, interior design, Leopard Stark Carpet, Melissa Marcogliese, Prestige Remodeling, Remy Ludwin, Rooms With A View Bookmark the permalink. Orange, pink AND leopard? swooon! Media free rooom, I’m all over that idea. Loving the orange room it doesn’t get any better! 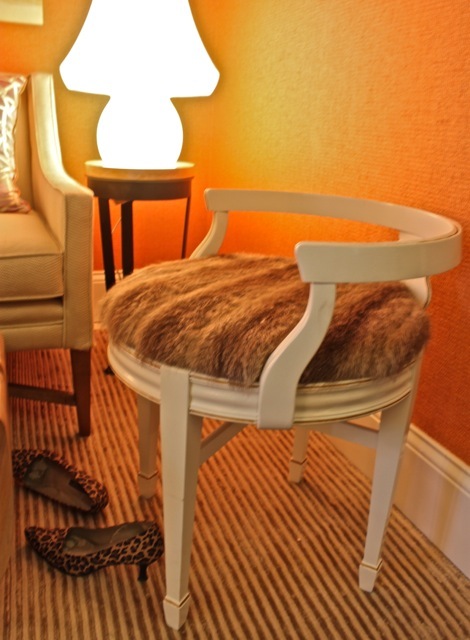 I love the idea of repurposing mom’s mink on the chair cover! I have a pillow made from my mom’s mink coat, and it is a special reminder to me every morning when I sit in my chair. I think this is a great idea! I’m also loving the orange painted desk! I admire people that design rooms with purpose and personality. Cookie cutter design in this day & age amazes me. We have such exposure to magnificent ideas and sources. Why would anyone want to create a living space that doesn’t tell it’s visitors who lives there? How wonderful to be that 10 year old girl living in such a elegant room. I’m obsessed with orange. 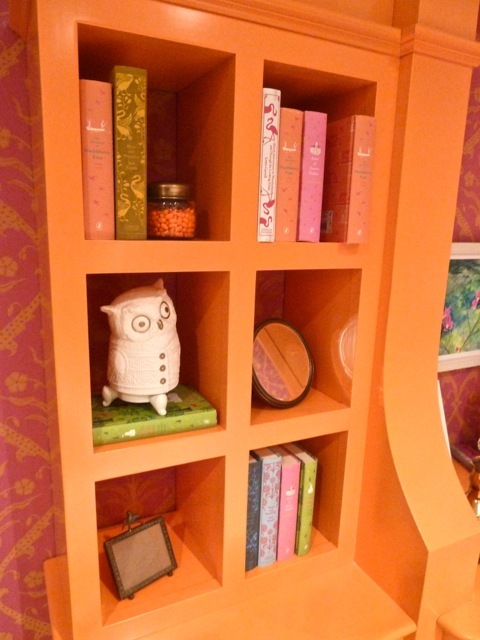 That custom desk is so chic and the hot pink and orange wall paper , to die for! When can I move in! Love the “Hadley” Lamp! I want one for my house! Melissa Marcogliese’s space is beautiful those pops of color are stunning, one of my favorite color combinations is the orange/pink/salmon! Thank you so much! It was a fun space to create! I love the concept of the first room, we have one television in our house and I do keep one room, computer/iphone free at all times. My fav today were the vintage lamps, beautiful. Love all the orange and pink. Such a cheerful, chic combination. the orange desk and martini’s at the ready, what’snot to love! Oh my goodness… that heart-shaped desk chair is adorable and I love the warmth these spaces exude! Great to see you last night, Q. Please do share where you found the heart-shaped ottoman/desk chair. Love it! You can contact me for a custom heart ottoman. Several different fabrics to pick from. 80 queries in 0.445 seconds.